runjoey: Screaming down the Mountain. Scream Half Marathon that is. Screaming down the Mountain. Scream Half Marathon that is. Coming into this I wasn't in the shape I'd hoped to be but I am pain free and the running is going well so I was eager to test myself on this mostly downhill route. Yeah, mostly downhill. But somehow there is 496 feet of climbing mix in there too ! More on that as the story unfolds. 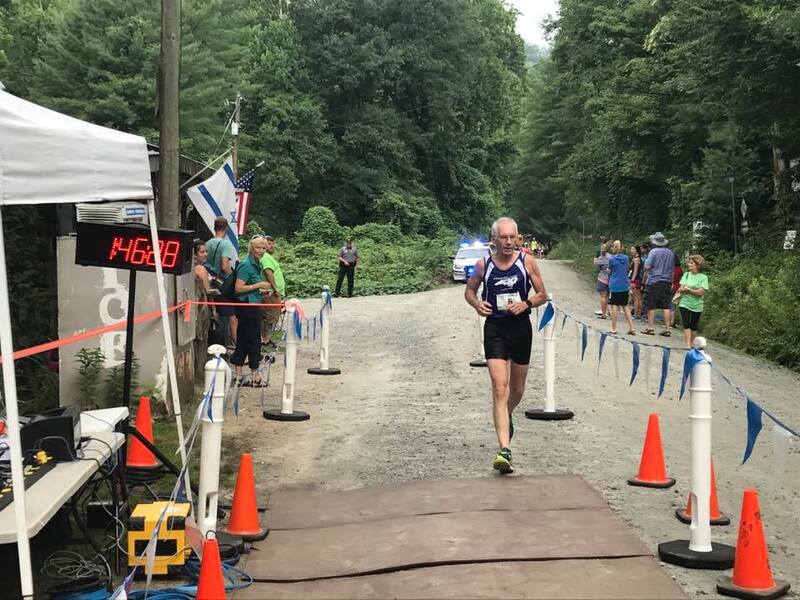 The race is a point to point beginning in Jonas Ridge and ends down the mountain in Mortimer which is a ghost town in the Pisgah National Forest. The first two miles on paved roads and then gravel the remainder of the way after entering the park service land. Because of this we would have to take a shuttle to the start and then another from the finish back to Brown Mountain Resort Campground where our cars had to be parked. I arrived in plenty of time to catch the bus and after a pleasant enough and scenic ride to Jonas ridge I had an hour to kill before the start. Fortunately there were quite a few Raleigh area runners with ties to the NCRC, MTC and Capital Runwalk for me to visit with while waiting. Because of the restrictions from the Park Service and logistics the race is limited to only 300 runners so it was nice to know so many in the race this far away from home. With 15 minutes to go I made final preparations and headed toward the start about 600 yards away after only 1/2 mile warm up jog and no strides. I figured with the downhill and my low base of miles I would skip most of my usual warm up routine. You always hope for cooler weather in the mountains but it was 70F and about 100% humidity at 8am so not much in the way of a break for us ! I lined up behind a couple of other grey hairs near the front and then we were off. And up. Most of the 1st two miles of the race are uphill. Its mostly a gradual climb with nothing steep and I just planned to take it easy until the course turned downhill. I watched the two older guys pull away but didn't even think about trying to stay with them. I would stick to my plan and let the race unfold as it may. I was feeling pretty good and very happy to pass mile 1 in 8:22 which was about the pace I needed to average to make my realistic goal of a sub 1:50. To be honest I wasn't sure what time to predict on a flat course right now in the comeback but I did feel the 1:50 was reasonable with the gravity assist. By mile two the small field of 300 was already spread out quite a bit, the grey hairs were out of sight and after that mile in 8:36 I was looking forward to stretching it out a little. As I began picking up speed going down I was still holding back a bit because it was still further to go than my longest run so far this year and I didn't want to beat my legs up too much. By mile 3 ( 7:48) I was already worrying a little if my legs would cramp on me or give out from the pounding but soon I relaxed and it didn't seem that it would be an issue. As I said, we were spread out and I was running alone maybe passing a couple of people since mile 2. Around mile 4 a young couple eased by me but I would keep them in sight. Mile 4 was 8:01 and I was a bit disappointed because it felt faster but then I remembered that I'm not in the same shape as I was 5 months ago and just accept it for what it is and be happy that its still adding a cushion to my goal time. Mile 5 was anther 7:48 and my confidence was growing but I was still holding back a little bit and just enjoying myself. You really have to pay attention to where you are going and putting your feet to avoid the bigger chunks of gravel , ruts in the dirt and exposed larger rocks poking through but then there were not many views along the way to distract you. Just the dirt road and a tunnel of green. Mile 6 was an 8:02 and I was happy to be approaching the halfway point still feeling strong. And then about that point I was a bit surprised to have a hill to climb. I did expect a little bit of up but this was fairly significant with a total gain of 121 ft.. No wonder I slowed down to 8:32 for mile 7. 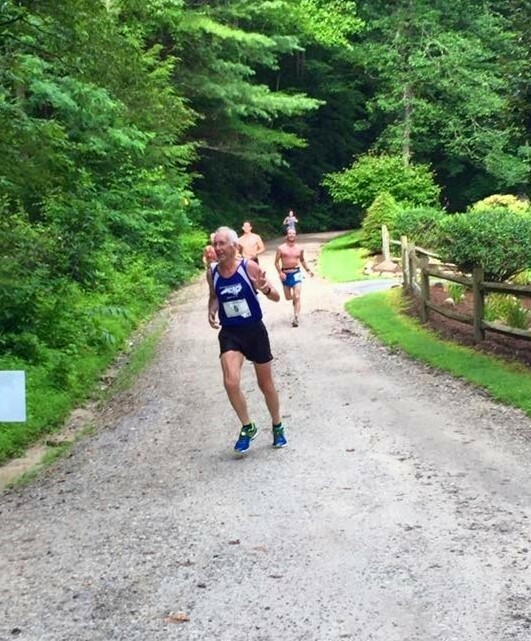 Another 40 feet of climbing to begin mile 8 and then a screaming downhill worthy of the race name with 436 feet of loss in mile 8 ! It was my fastest mile of the day in 7:24 but at times it was so steep that I couldn't run as fast as I wanted having to be careful and not beat up the legs any worse than I could help it. By now I was feeling great and was ready to begin to push the effort to the end and about the same time I could see what looked like about 10 runners spread out up ahead including the young couple that had passed me back at mile 4. I started focusing on trying to reel them in one by one as I passed mile 10 in 7:39. From 9.5 to 11.5 was about the most drop of the race with 10 losing 357 feet and 11 another 426 ! 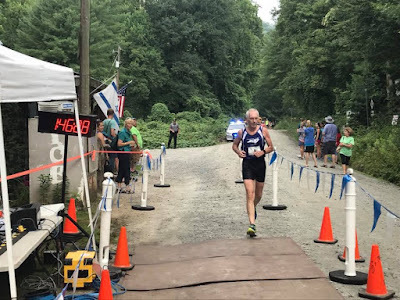 I was just pushing as hard as I could without losing control and steadily passed one after another of the runners I could see and was really enjoying myself. Mile 11 was 7:37. About 11.5 we had landed in the Wilson Creek river valley and the big descent was over and we made a right hand turn. NCRC President Rebecca Sitton was volunteering there and cheering for me and snapped a nice picture of me waving and smiling. The smiles didn't last too much longer as the course made a gradual rise. By mile 12 the effort and warm humid conditions were taking their toll and the legs after all the pounding were having a hard time keeping pace. That was an 8:26. Just one more mile to go but I was toast. I tried to will my legs to move faster but it was a painful shuffle as I hoped to see the finish around every turn in the curvy road. I did pass a couple of more runners that were suffering a bit more than I was .Finally it came into sight but I was hearing footsteps coming fast. I picked up the pace a little but it was obvious I was going to be passed. I didn't care. I knew it wasn't anyone close to my age so let them have their moment of glory passing the old guy. I had no desire to try a sprint and puke at the finish ! The end. Photo credit Bobby Aswell Jr.
And then it was done . 1:46:28. Certainly a lot better than I expected. And a harder course than I expected also. But I had fun other than that lst mile lol. Good enough for 2nd in my age group. This is a good confidence boost on my fitness level and also that my body held up to the punishment with no problems or issues. I grabbed my drop bag and slowly walked to the picnic area but before getting on the bus I soaked in a cool creek for about 15 minutes which felt wonderful after the beating my body just took. So that was my Scream. A well organized fun race and a good excuse to travel to a beautiful area of the NC mountains. Will I return? Maybe. So many things to do and so little time.